QUALITY GAGING TIPS MMS FEBRUARY 2018 30 mmsonline.com Measurement Tools Checking Roundness Between Centers A dedicated roundness machine is the method of choice for achieving the most proper and complete measurement of roundness. However, for some layout work or when an indication of the roundness of a part is required, the bench centers radial method is a useful plan B. This measuring method supplies the most important component in the measurement of roundness: the variation of the radius length around the entire perimeter of the part. The process for measuring roundness is sup- posed to be based on the axis of the part and by mounting it on the same centers used to man- ufacture the part. This is correct according to general interpretations of the concept known as roundness. But what happens in principle and in reality can be different. Several factors inf luence the reliability of the roundness measurement; the major one is that the true axis of the part is most likely the one that will be established by mounting the part in centers. Whether it be a single factor or a combination of them, the result is a measurement that generally will be larger than the true out-of-roundness. These discrep- ancies represent the major drawbacks for using this type of system. However, if you understand the elements you are dealing with, then you can set up a basis for part qualification when the tolerances are in your favor. Roundness measurements between centers are typically carried out with a set of bench cen- ters and some readout device. Most centers will have a fixed reference center and a retractable "live" center. The readout could be a mechani- cal test, dial indicator or electronic equivalent. After clamping the part between the centers, the probe is brought into contact with the sur- face of the diameter to be measured. Typically, the test indicator or amplifier is zeroed out at any point on the part, then the part is manually rotated 360 degrees and the dial is watched to measure the total indicator reading (TIR), the span between the maximum and minimum value obser ved, which is referred to as the radial out-of-roundness. Some of the sources of errors in this method are pretty obvious, and some may be subtler. Here is what is important when trying to obtain the best results: the center holes on the part should be made to the specification for angle and depth. Otherwise, they are not apt to match up to the more precision angle, likely found in the centers. Speaking of the precision centers, they both should be precision tapers, and they must be at the same height and parallel to the surface. Since these components are setting up the part reference, the accuracy is critical to control both the f latness of the surfaces for the centers and the height of the centers. In most cases, these are held to tolerances less than 0.00025 inch. From these tolerances, you can start to see the basic errors that are built into the setup. If your part roundness tolerances are anywhere near the For the best results, the center holes on the part should be made to the specification for angle and depth. 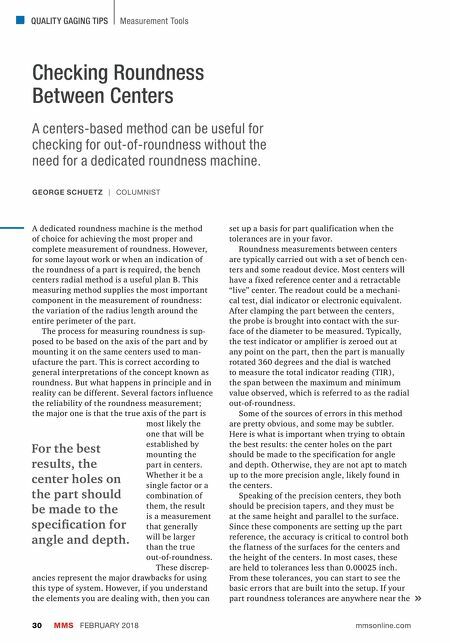 GEORGE SCHUETZ | COLUMNIST A centers-based method can be useful for checking for out-of-roundness without the need for a dedicated roundness machine.